Located in Jingxi County in southwest Guangxi, the area borders on Viet Nam to the south. Known as the "Lesser Guilin," it features an enchanting karst landform with hills rising one after another, waters flowing in the valleys, and rocks and caves dotting the landscape. Jingxi County enjoys a comfortable climate. There is neither hot summer nor bitter cold winter. It is a tourist center with a charming landscape and a summer resort in southern China. It is in Hurun Township, more than 30 kilometers south of the Jingxi County seat. 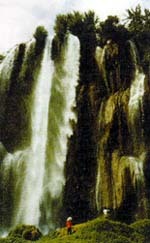 The Sandieling Waterfall (three-tier waterfall) is 30-odd meters wide and cascades down the hillside for more than 30 meters, causing thunderous splashes. Nestling among the hills in Yongle Township, six kilometers north of Bose, the mirror-smooth lake is dotted with green isles that pop up out of water. There the visitor can go boating on the lake, climb the hills, or feast his eyes on the beautiful scenery.